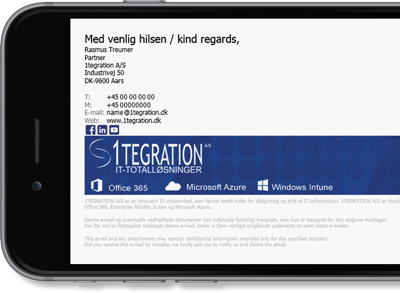 1tegration A/S is a Denmark-based IT company that specialises in consulting and managing its clients’ IT infrastructures. 1tegration has extensive experience in the IT infrastructure business employing a highly trained team of certified consultants. The company have built its reputation by helping customers work smarter through increasing productivity and reducing IT costs. Exclaimer Cloud - Signatures for Office 365 fits our needs perfectly. With organizations becoming ever more digital, and the increased in BYOD (Bring Your Own Device), it is no wonder that there is a strong need for consistent, functioning email signatures on numerous devices. As a Microsoft Cloud Solution Provider, 1tegration already had many customers already using Exclaimer’s on-premises Exchange email signature software. Looking for a solution that would work directly with Office 365, 1tegration came across Exclaimer Cloud - Signatures for Office 365. “Exclaimer Cloud - Signatures for Office 365 fits our needs perfectly. As a cloud-based solution, it works perfectly with Office 365,” stated Mr Treumer. After using Exclaimer Cloud - Signatures for Office 365 internally, 1tegration has been recommending the solution to its customers. 1tegration’s Exclaimer Cloud - Signatures for Office 365 customer base now comprises over 360 users. “Exclaimer is a great partner – we highly recommend them,” concludes Mr Treumer.